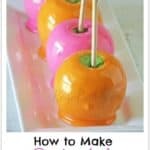 These multicolored candied, splattered and glittered apples will surely be the highlight of any get together. ** I used rather large Granny Smith Apples. I love the tartness of the green apples, but I wish they had been smaller. They were hard to wrap and I wasn’t able to dip as many as the recipe indicated! Combine the sugar, corn syrup, water, and food coloring (both the white and color you want the apples to be) in a heavy boiler (sauce pan). Turn on medium to high heat and let the mixture come to a boil. Be sure to have a candy thermometer inserted into the mixture but not touching the bottom! Let the candy come to 302°F (hard crack stage). This will take about 20 minutes. There’s no need to stir or disturb the mixture while it heats… just be patient! While that’s going on… make sure your apples are ready (washed, dried, and on the sticks! ), then spray a cookie sheet with non-stick butter spray. The “butter” flavor isn’t necessary, but butter makes everything better, right? If you don’t have butter, just use regular non-stick cooking spray. When the candy reaches 302°, immediately remove it from the heat and use a rubber spatula to stir in the vanilla (or other flavor). Stir it gently to get the flavor evenly incorporated but without mixing in too much air. You’ll want to work quickly because the candy will start to cool immediately. As soon as the flavor is evenly mixed in, begin dipping your apples.